A man with a plan got into a van and called himself Batman. Then again, was the man called Dan and his plan a flan, making the van a simple flash in the pan? Or better yet, should I just shut my own cake whole and tell you this tale? 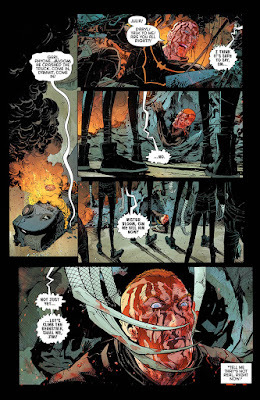 A tale with a tail created by Scott Snyder, Greg Capullo, and published by DC Comics, in February 2016. TO QUOTE Neil From The Young Ones: 'Who wants to eat lentils?"'. Have you ever wondered what it would be like to read a comic book where Batman and the Joker just talked to each other, acknowledging the fact that in each person's case it would be their previous incarnation doing the talking (i.e. a pre-Batman Bruce and a pre-Joker Joker)? Well, wonder no more my friends, as that comic book is right here, ready to read. Although, I must say, that in this instance it does appear that the Joker's mind has also been wiped like Bruce's, Bruce is currently deterred about that whole Mister Bloom situation, and what they talk about isn't just a casual conversation, more like a battle of words where the Joker amps up the tension between them, deliberate or not, one page at a time. Now one of the first things the Joker does that causes some concern is to pull a gun out from his pocket: initially implying that he may shoot Bruce, although eventually defining his actions as a previous 'cry for help'. 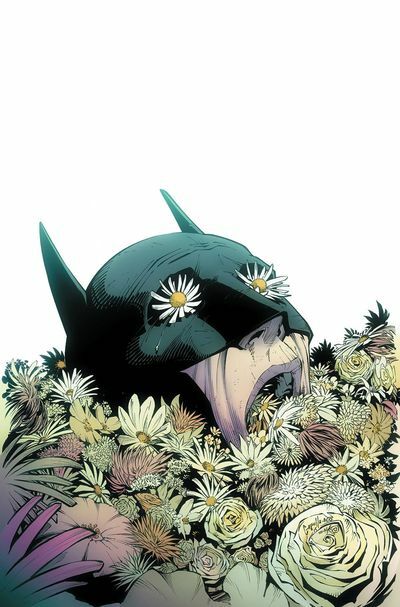 The next alarming thing he does is to say to Bruce, 'don't become who you were': once again, initially implying that he knows Bruce was once Batman, although eventually defining his statement to mean, 'help the common man as you presently are, and not the industries as the head of Wayne Tech'. However, it's at this particular stage of their discussion, with tensions high, ready to break (kind of), that this strand of the story suddenly gets interrupted by its intertwining sub-plot. Not that this is a bad thing mind you. Mildly annoying, yes. But bad, no. You see, while Bruce and Mister J were talking to each other in the park, elsewhere in Gotham, Mister Bloom was torturing a captured Jim Gordon, and doing a pretty good job of it too. So when their discussion eventually reached this stage of the story, this second part of the plot took over and we saw Bloom (and a badly beaten-up Jim) rampaging through the city streets, terrorizing the citizens, and giving them an offer some can't refuse -- come join me in my quest and I'll make you powerful. Now if you don't mind, I don't really want to go any further with my description of this issue, because if I do, I'm sure I'll spoil it for you. That said, though, what I can say is that it was a very suspenseful comic to read: with half of it dedicated to a discussion between two old arch rivals, whilst the other half was about a giant-sized plant-man causing havoc in Gotham, trying his best to make people see things his way. And yes, to a degree he does manage to make some people see things his way. It's just that Mister Blooms justification appears to be counteracted by his harsh actions, bold posturing, and wild bravado, thus making him more of a comic book styled villain than a man of peace. Thankfully there are two things in place that may be able to stop him (Not yet, but maybe next month). Yet unfortunately I won't be able to talk about them either because it might spoil the surprise. That being said, I suppose I can insinuate about one of them during my closing section, Ha! So overall this was a pretty decent issue of Batman. Despite being a story of two unequal halves, with each half related to two different scenarios, at the end of the day Greg's art was both atmospheric and well paced, Scott's story was very intriguing and suspenseful, and all in all, Yowzer, good job. Let's see what we'll have in store next month. I'd like to musically match up this tale to the theme tune from the 1963 version of 'The Day of the Triffids', simply because of that sequence where we got to see a giant-sized Mister Bloom rampaging through the city streets. That, plus it does kind of sound suspenseful. 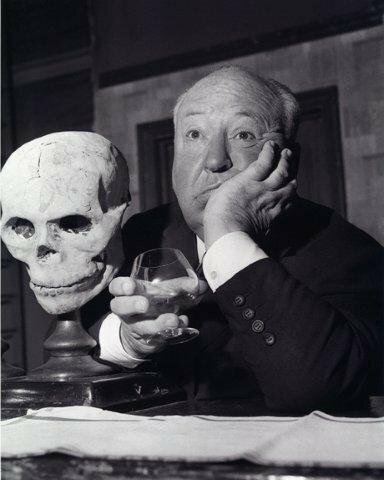 Alfred Hitchcock was the type of film director that instilled a feeling of suspense in each of the scenes he composed. Sometimes this suspenseful tone built and built and built, until eventually the release was finally popped. Whereas at other times Alfred liked to play around with the viewer, and managed to suspend disbelief with what he didn't show, rather than what he did. To me, this issue of Batman did a similar thing but in a slightly more comic book fashion. And that is why I want to compare it to Mister Hitchcock, himself a master of suspense. Ask Superman to help me wash! Grow a beard on your nose! Take me to my cave! Cancel my subscription to Netflix! Sing that song about the thing!